At Sabbathday Lake, members of America’s last surviving Shaker community celebrate a new beginning. By Cynthia Bourgeault. After eight years of steady growth, there is nothing shaky about Renaissance Greeting Cards of Sanford. By Susan Lamb. An engaging new show at the Maine State Museum focuses on the pleasures and perils of turn-of-the-century Maine childhood. Color photographs celebrate the crisp serenity of a special day. Any way you say it, it means New Year’s to some Mainers. By John Gould. The collaboration of a talented young couple in carving marvelously realistic birds has won them national recognition. By James P. Brown. It is my own feeling that we should all write in exactly the same manner that we speak, and it isn’t difficult once you get the hang of it. By Caskie Stinnett. Cover: “Harbor Road Christmas” (18″ x 24″), acrylic on canvas board, by Judith Appleton, who lives and paints on Harbor Road in the shadow of Camden’s Mt. Battie. 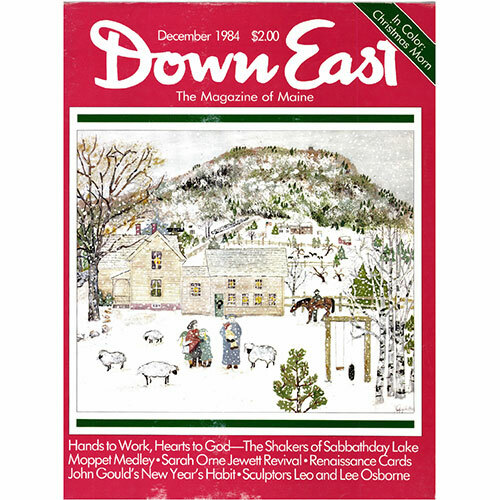 Mrs. Appleton contributed the cover painting for our May, 1981, issue and has shown at the Maine Coast Artists Gallery in Rockport. Her lithographs may be viewed at the Pine Tree Shop and Bayview Gallery in Camden.